White & White, Skaneateles, N.Y.
SYRACUSE, N.Y. – Steve Allman said he was thrilled with the wonderful weather, which allowed a full house for his Salt City Winter Antiques Show in the Center of Progress Building at New York State Fairgrounds January 21-22. The show drew 250 exhibitors and more than 4,000 shoppers for the weekend. “This show is remarkable in how the area supports it, said Allman, “We get wonderful crowds both days looking for all kinds of antiques, furniture, early décor and collectibles and even now later collectibles into the midcentury, and these dealers have it.” He noted that the show is big enough to offer the variety customers seek. 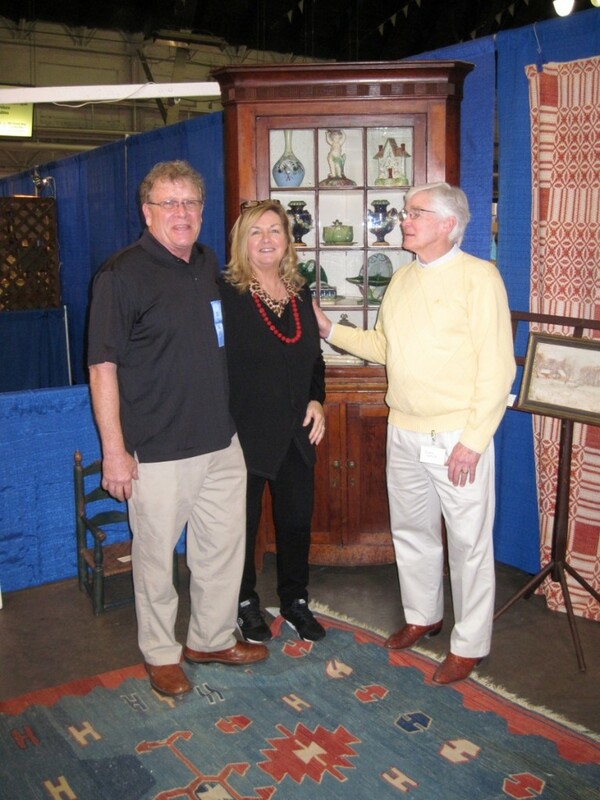 The show’s promoter, Steve Allman and his wife, Judy, were chatting with dealer Steven White about the Bergen County, N.J., corner cupboard he sold during the show, just before it left the show floor. Steve White of White & White, Skaneateles, N.Y., offered some of the show’s earliest merchandise. His sales included a Bergen County, N.J., corner cupboard from the Eighteenth Century, sold on the second day after the buyer deliberated for two days; a pair of portraits from the same time period; and a variety of small silver accessories for the dining room. On the other hand, Anita DeOld, trading as A Touch of Glass, Verona, N.J., was selling early 1900s Christmas decorations and glass, including pieces from an enormous collection of late Nineteenth Century hatpins. Her inventory also included head vases from the 1930s and 1940s, and various other later forms of decorative glass and earthenware. Miniature chests of drawers were big sellers for Gary Smith, Big Flats, N.Y. He sold several, including one that was a model of Chippendale style, along with a pair of Eastlake chests. Dealers didn’t just come from New York though. Glenn Freeman is a Baltimore-area auctioneer who took an oversize booth to show all he had to offer. His sales were primarily smalls, such as silver pin cases, pattern glass salt cellars, dominos, pin cushions, inkwells and a great deal more of these Nineteenth Century treasures. Red Barn Antiques, South Egremont, Mass., specializes in lighting, with mostly Nineteenth Century fixtures that once ran on some kind of fossil fuel (whale oil, kerosene or gas) that have been converted to electric. Dealer John Walther does most of the work on the fixtures, including polishing the metal and brass, and then he and his wife do the marketing. He noted sales were good and included “several ceiling fixtures, a couple pair of converted lamps and also some of the earlier copper.” He said they also sold blue daisy and button glassware. Dolls and bears were walking out the door, according to Stacey Lea, the owner of Stuck on Dolls, Laurel, Md. She and her husband were showing their collection, filling tables that were depleted over the weekend as artist bears were sold in good numbers, and so too were dolls and the accessories for Barbie dolls and other knickknacks for them. Peter Kerta, Teaneck, N.J., and Guinea, West Africa, offered native African art, while Sharon Green Antiques, Sharon, Conn., was selling small personal articles, including silver perfume chatelaines, desk accessories and sewing paraphernalia. Sandra Willson, Churchville, N.Y., sold pattern matching silver flatware, and Kathleen Dylin, Whitesboro, N.Y., offered an eclectic mix that included an Eames chair and ottoman. Colony Shop Antiques and Art has a full-time shop in the Syracuse suburb of Fayetteville, so this is among a very short list of shows it does. Its results, however, were rewarding, according to owner Edward Becker. Sales included a Nineteenth Century Swiss disc music box in good condition with several discs; a Black Forest bear measuring more than 2 feet long; Chinese imports in jade and porcelain; jewelry; and fine art. Danielle’s Countryside Antiques, Corfu, N.Y., was selling kitchenalia and iron utensils, while next to her, Michelle Stupnick, Middleport, N.Y., offered earthenware and Nineteenth Century art prints. The collections here offered great variety for all, spanning centuries, geography and styles – in short, something for just about everyone. Allman Promotions conducts three shows each fall and winter in this facility. 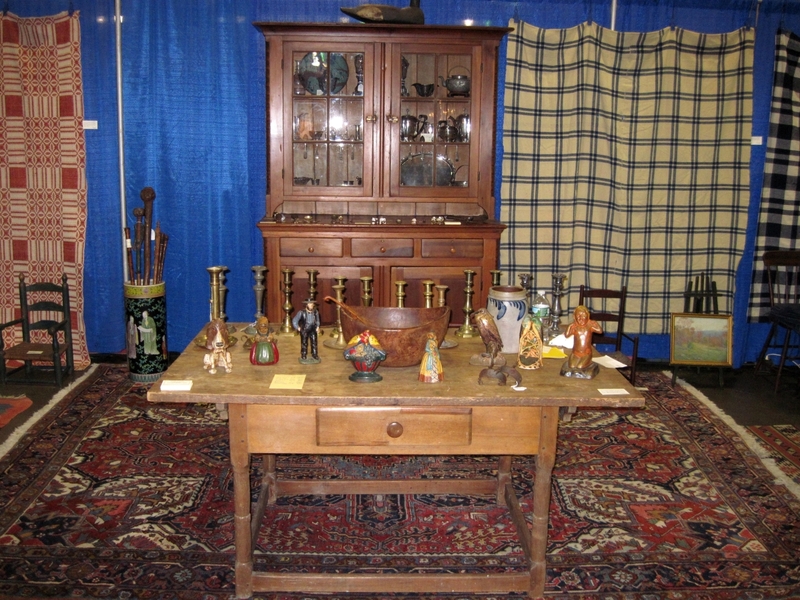 The next event here is the Greater Syracuse Antiques Expo March 11-12. 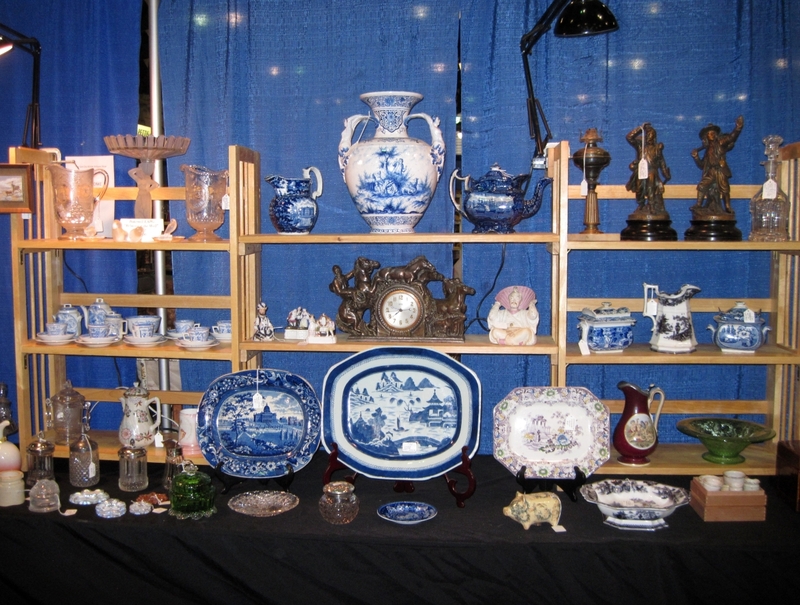 Allman also produces the Madison-Bouckville Big Field Antiques Show August 18-20 and a group of Florida shows. For more information, www.allmanpromotions.com or call Steve at 315-686-5789.